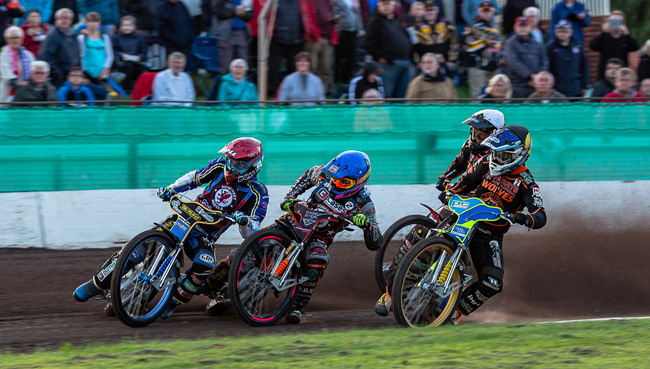 The 'Cases' Somerset Rebels marched into the title-deciding play-offs with a comprehensive victory over Wolverhampton. The 59-31 crushing score-line eliminated Wolves from reaching the final four in the SGB Premiership and will give the Rebels their first taste of top flight 'play-off' action, something that enthuses team manager Garry May. "It is a great feeling to know that we will be there in those play-offs. Of course we know from experience what making the cut has felt like, from our time in the second tier, but to be part of the big boys competition makes it a really special achievement.
" I have to say, if my team rides like they did tonight then you would be foolish to write little old Somerset off. The whole team tonight were awesome, my guests - Adam Ellis, Nikolaj Busk Jakobsen and Todd Kurtz were all solid and great to work with. Aaron [Summers] had a good night so too did Nico whilst my maximum pair of Doyley and Jack [Holder] were indescribable. Some of the moves they made were unreal and that all added to a great meeting here." "I looked down the Wolverhampton team and whilst they didn’t have Rory Schlein I thought to myself, they are going to make this tough. I am not sure whether our boys made them look ordinary or whether they had an off-night but I am taking nothing away from Somerset's team performance this evening." Jason Doyle stormed to a 15 point maximum whilst Holder settled for a four ride 'baby' maximum being paid for 12 points as he went unbeaten by an opponent. The meeting was virtually won by the halfway stage but the crowd had plenty to cheer as the racing was intense throughout, May adding "the track yet again was in great shape tonight and that helped and I can't praise the track staff enough for all their efforts in giving us the 'old' Somerset strip back, after those material problems earlier in the year." The Rebels now face a schedule of three meetings in as many days as they travel to Leicester on Monday, then host King's Lynn on Tuesday before completing their scheduled league fixtures on Wednesday (5th) with a trip to Belle Vue, which has been brought forward from the 10th September. The original date is the final date for league fixtures to be completed by and so bringing it forward provides a contingency in the event of bad weather. SOMERSET 59: Jason Doyle 15, Jack Holder 11+1, Nikolaj Busk Jakobsen 9+2, Adam Ellis 7+1, Todd Kurtz 7+1, Nico Covatti 6+1, Aaron Summers 4. WOLVERHAMPTON 31: Sam Masters 9+1, Jacob Thorssell 7, Kyle Howarth 6, Ashley Morris 6, Jonas B Andersen 2, James Sarjeant 1, Rory Schlein r/r.